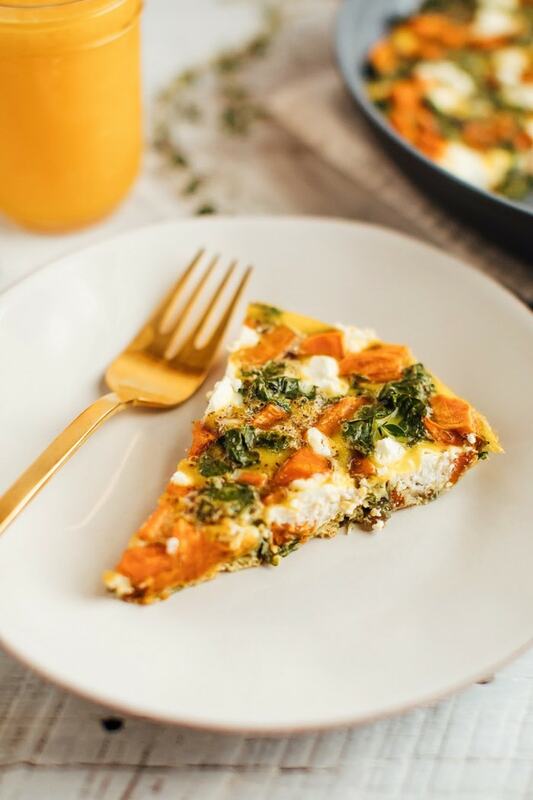 Add this sweet potato kale frittata to your weekly menu for a quick and easy healthy meal that can be whipped up in less than 35 minutes and served for breakfast, lunch or dinner. This post is sponsored by Pete and Gerry’s Organic Eggs. 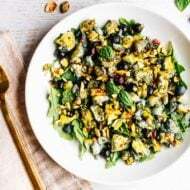 Oftentimes I find that people tend to overcomplicate eating healthy thinking that they have to slave away in the kitchen, cooking up elaborate meals each day in order to eat nutritiously. While I’m certainly a huge advocate of cooking and eating more at home, I’m also a big fan of keeping things simple. This is one of the main reasons I like salads and bowl meals so much. They’re basic… in the best way possible. 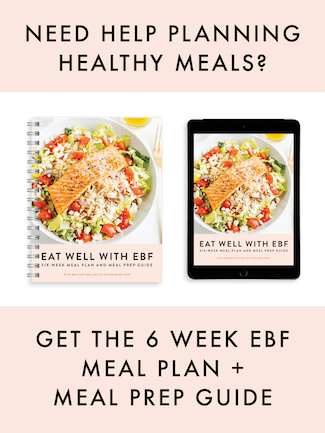 Want to know my secret template to making a healthy meal? Here ya go: lots of veggies, lean protein, healthy fats and smart carbs. With this combo I get a good mix of macronutrients, which makes for a satisfying and filling meal. And thinking about meals with this sort of compartmentalized approach makes it easy to throw something together, even on days/nights when it seems like we have nothing in the house to eat. It’s funny because Isaac often opens the refrigerator and reports that we have nothing to eat. I usually take this as a challenge and immediately start rummaging through the fridge, grab a few things and have dinner on the table in less than 30 minutes. Over the years I’ve become a master at making something out of nothing in the kitchen. That said, one of my go-to quick and easy meals for nights like this are egg-based because even when the fridge is getting quite bare we usually have a few eggs on hand. There are a ton of different things you can make with eggs, but we love making frittatas. Not only do they cook up super fast, but you can toss just about any vegetable you want into the mix. 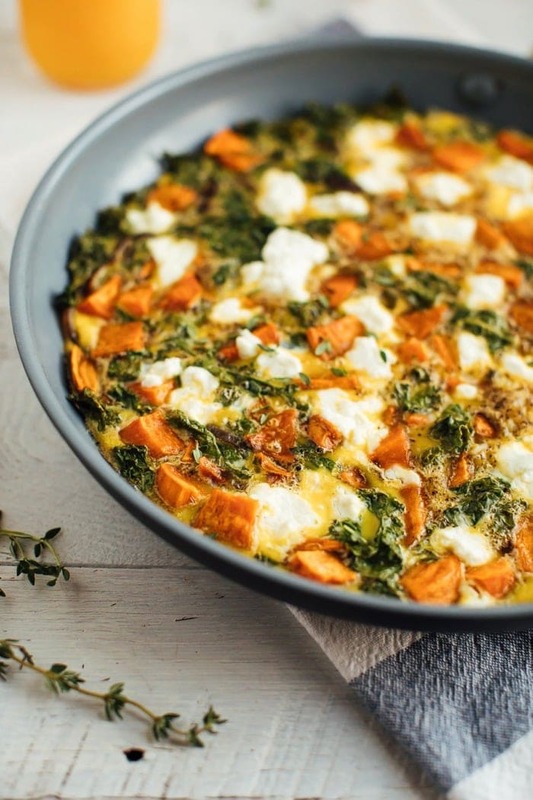 The sweet potato kale frittata I’m sharing today is a fun one! 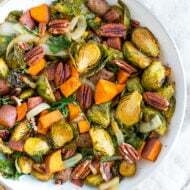 It was actually inspired by this roasted sweet potato and kale salad that I absolutely love. 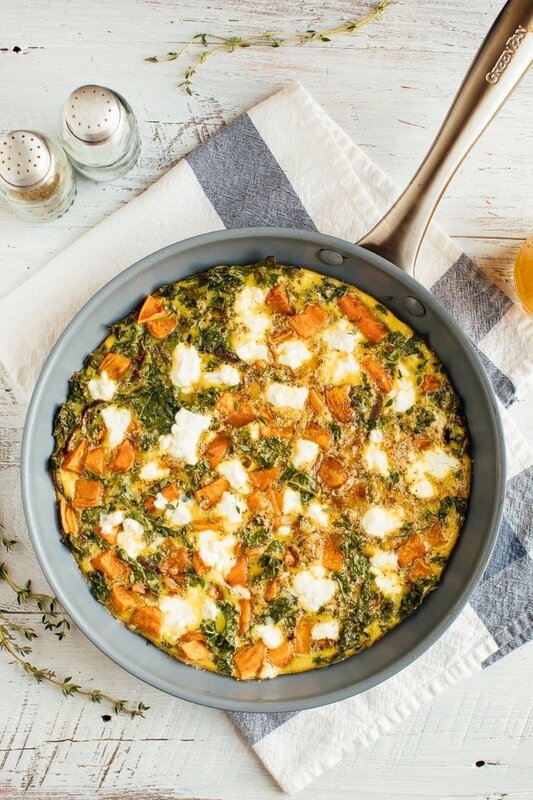 The combo of red onion, roasted sweet potatoes, dark leafy kale and fresh thyme is delicious and I knew it would taste so good baked into a frittata with creamy goat cheese. I teamed up with Pete and Gerry’s Organic Eggs for this recipe. As I’ve mentioned before, their eggs are organic, free range, Certified Humane with no added hormones, antibiotics or GMOs. Pete and Gerry’s is also a Certified B Corporation, which is so awesome! 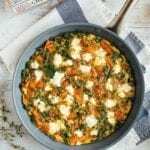 This frittata is delicious served warm, but you can definitely save the leftovers and eat it cold or reheated the next day. I know some folks are weird about cold eggs, but Isaac and I actually loved eating it cold for breakfast the morning after we had it for dinner. The flavors are just so good! 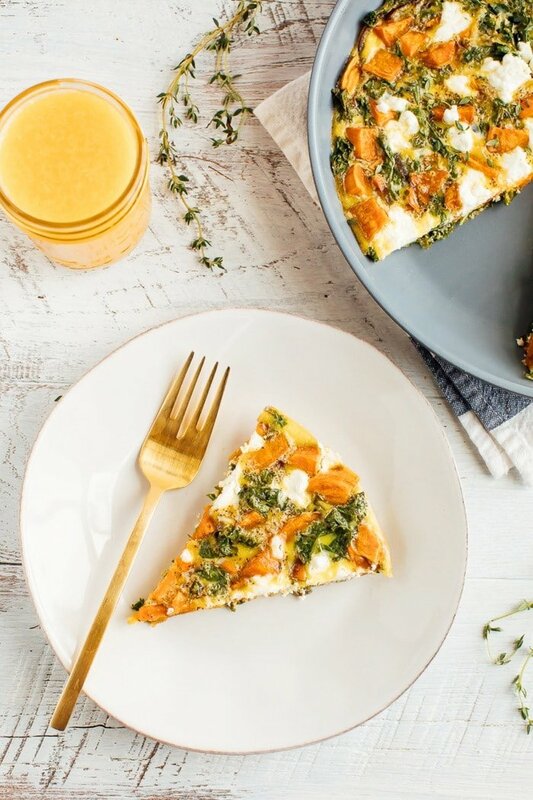 This sweet potato kale frittata is a quick and easy healthy meal that can be whipped up in less than 35 minutes and served for breakfast, lunch or dinner. Spread chopped sweet potatoes on a baking sheet with 1 teaspoon of oil. Toss and then roast for about 20 minutes or until tender. In the meantime, melt remaining 2 teaspoons oil in an ovenproof skillet over medium heat. Add the onion and garlic and sauté until tender and golden, 8 to 10 minutes. Add the kale and cook for another minute, until just wilted. Remove from heat and add roasted sweet potatoes once they’re done. Crack the eggs into a large bowl, add the salt and beat well with a fork. 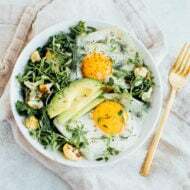 Pour the beaten eggs into the skillet and use the fork to press the vegetables down into the egg mixture so that the eggs cover the veggies completely. Crumble the goat cheese over the top, then place the pan in the oven and bake until the center is set and lightly golden, 10 to 15 minutes. Cut into wedges and serve warm with a sprinkle of fresh thyme. 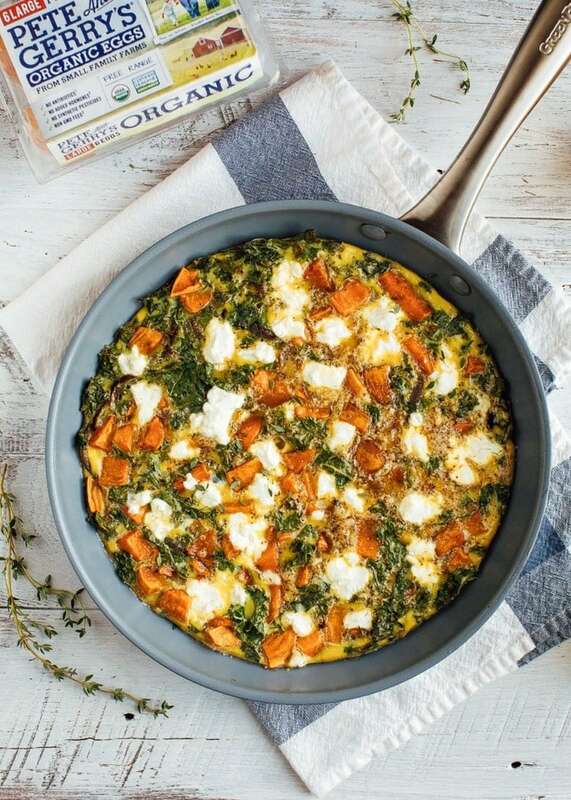 If you make this sweet potato kale frittata let me know how it turns out in the comment section or share a photo on social media. Just be sure to tag me (@eatingbirdfood + #eatingbirdfood) so that I see it! Good question! I used a 10-inch non-stick skillet. What cheese could I sub in? Not a fan of goat cheese. This looks yummy. Cant wait tontry it out. Love Kary’s idea to do feta cheese. It should work really well. Another option might be ricotta. It’s still creamy without the tang of goat cheese. This looks so delicious and I happen to have all of the ingredients in the kitchen. I will definitely be trying this week! I love it when that happens. I hope you enjoy this frittata, Alex! Made this to bring to work for my lunches this week. Added hot smoked paprika sprinkled on top before baking. Just had a piece. Really good. Yay!! So glad you like it, Carol. Love your idea to add hot smoked paprika on top. Enjoy having it for lunch this week! This sounds like such s perfect meal! Adding it to the menu next week! Yay!! Can’t wait to hear what you think of it, Amanda! Just finished making this for the first time. DELICIOUS!! Thank you for this healthy, yummy recipe. My kind of breakfast! This looks killer! This couldn’t be more beautiful! I pretty much want this for every meal of the day. Just made this it was so good! sure. Thank you so much for the recipe! Made this tonight and it was a hit. Seriously so good! My husband already asked to add this to regular rotation. Thanks for another winner, Brittany! This is so delicious! I have made it several times, and it definitely goes fast in my house! Thank you for posting such a tasty and easy recipe!